I saw this one at the South Coast Botanic Gardens near Long Beach, CA. It’s a firecracker plant in a hanging basket. 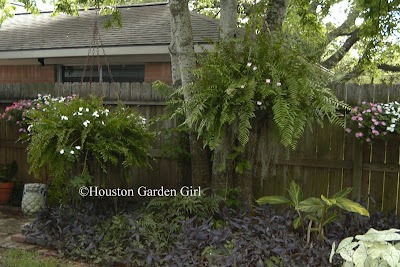 Here are some examples of nice hanging baskets with ferns, these were at a home on the Westbury Garden tour in 2006. Any other suggestions for unusual plants to put in hanging baskets? The final day was rushed for me. I checked out of my hotel that morning and took a taxi to Lancaster Ave to tour the gardens, then jetted off to the airport for the cross country trip to San Diego. Jim was hosting lunch at his house that day, but I only had time to say goodbye to the folks that arrived early to lunch and thank our hosts. The houses of Lancaster Ave. were more of the same…and I mean that in a good way. (I shutter at the thought). Mary’s Garden is one of the larger gardens we visited and has a very touching story to go along with it. Mary was terminally ill and wanted to have a garden next door. Mary & James happened to own the house next door so they tore it down to make way for the garden. She gardened there for a year before passing away. James is now married to Annabelle. 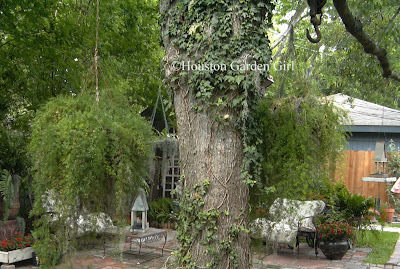 I really admire her choice of plants, she is growing some of the same plants that we grow in Houston. It is definitely a labor of love in the winter when all of those plants have to be brought indoors. 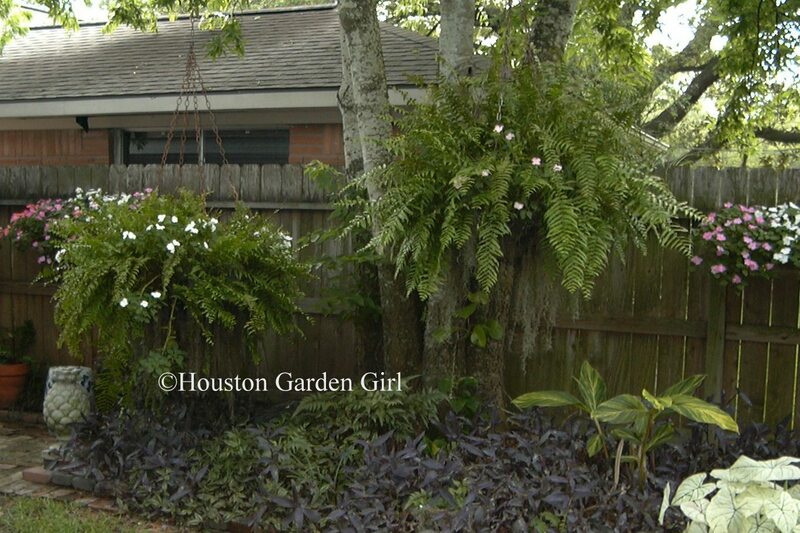 The Mexican Flame vine pictured to the left is amazing, think I’ll get one of those for my garden. A few more pictures from Lancaster Ave.
Here’s a glimpse of the interesting architecture of many of the houses we saw while in Buffalo. Our final stop was at Jim Charlier’s house for lunch. Notice the for sale sign? A huge thanks once again for all the work that went into pulling off such a great event. Until next year, my fellow garden bloggers. It was a pleasure meeting all of you. Today was the last day of Garden Walk Buffalo 2010. Maybe next year you will be one of the attendees. I finally made it back to Houston on Thursday, it’s good to be home. After the bloggers meet-up in Buffalo, conference in San Diego, then work in Long Beach & Bakersfield, it sure is nice to sleep in my own bed and be greeted by the boys (Scout & Rusty-the furry children) when I come home at night. Thanks to my mother-in-law and the 3” of rain, most of the plants survived unscathed. For the period that hubby was in charge of watering…well let’s not talk about that. On Friday, hubby and I went to check out the corpseflower named Lois at the Houston Museum of Natural Science. Her bloom peaked early Friday, we didn’t see her until Friday afternoon. Can you believe we bought our tickets around 10:30, but we were told our place in line was for 4:15!? It was like a mad house at the museum, everyone had to get a look at Lois (webcam link). I thought her bloom was going to open more, but they say she is vase shape, not saucer shape, so this is as open as she will get. I was surprised hubby wanted to come with me, plants are not his thing, but this one has a smell. An atrocious dead thing kinda smell. And that’s why he wanted to see it. It turns out that the smell wasn’t really that bad. I guess the stank peaked earlier in the day so he missed out on the disgusting. Saturday morning was my first day of training for the January half-marathon in Houston. Should be interesting, the 2 mile run was fine, but I can hardly imagine running 13.1 miles. After the run and since I was already sweaty, I did a few garden chores. The espaliered apple finally has some wire to grow along, it was starting to move skyward which can’t be good for an espalier. When I was in San Diego, I stopped by Bonnie’s (Vintage Garden Gal) amazing place and she had a cool looking espaliered fig tree. I might have to try that with my little one that’s still in a pot. I also relaxed in the gazebo and thumbed through the Garden Walk Buffalo book I received at Buffa10. Although, we can’t grow all the same plants they grow in their Zone 5 gardens, the book is inspirational – beautiful gardens, interesting architecture, and wonderful gardeners are featured. We should all be so lucky to have a Garden Walk in our town. The next stop on the Saturday tour was the Buffalo Botanic Gardens. The botanic gardens are one of many parks in Buffalo that were designed by Fredrick Law Olmsted, Sr. (the mastermind behind New York's Central Park). Rarely seen in the United States, the Buffalo Botanic Gardens are home to a striking Victorian style conservatory. It is shocking to hear the docents describe the downfall of the conservatory during the 60s & 70s. There was even talk of demolishing it. Luckily concerned citizens stepped in and saved this beautiful structure. The exterior of the conservatory had minimal gardens, but there is definitely room to expand and it sounds like those plans are in the works. Next stop, lunch. We headed over to Lockwood Nursery for a picnic lunch in between the family home, greenhouses, and the nursery. We were given a tour of the nursery by Mr. Lockwood himself. It was very interesting to hear from a vegetable farmer turned nurseryman and learn a little about how things are done in the nursery business. Our final stop of the day was the home of the extremely hospitable Mike Shadrack and his wife Kathy. They live in a small town outside of Buffalo in their very own woodland wonderland. Mike, being the Englishman that he is, had us over for tea in the garden. What a sight to behold, 70 plus teacups and saucers alongside scones with jam and clotted cream and a whole army of people to serve us. This was my favorite stop during all of Buffa10, it combined two of my favorite things, high tea and beautiful gardens. Not to mention the glorious house. Can you imagine having a stream running from the hill behind your house then out from underneath the front of the house...on purpose?! This is my new dream home. If only I could withstand the freezing winter temperatures, but this Texas girl has already found her northernmost migratory limit and it is further south than Buffalo, NY. Mike is the king of hostas, he is a world renowned expert with several books on the subject. Here Mike is pictured with the Hosta 'Mike Shadrack', which comes from very respectable parents: 'Great Expectations' and 'Rock & Roll'. After meeting the Englishman and comedian with such a big personality, that seems very appropriate. The woodlands were the perfect growing conditions for Mike, but Kathy needed a place to garden as well. So out went about 15 trees to clear space for the sun garden. She even has one of the heads from the Cranium Family that I mentioned in one of my earlier posts. By the way, I have acquired the lady cranium to keep Apollo company, more about her when her hair gets longer. So, that was Saturday. Wow, another great day in Buffalo, New York. Hello again readers! Sorry I have been away. After Buffalo, I traveled directly to California on business and there just hasn't been any time to get caught up on my posts. So now, let’s return to Buffalo. Our Saturday gardening soiree began with the trial gardens at Erie Basin Marina. We were greeted by a member of the horticultural staff. She passed out 4 small flags per person; they wanted us each to pick our 4 favorite plants and mark them with a flag. The results of this informal study will be used to communicate the public’s favorites back to the growers. The flowers are actually a deep red, this picture does not do it justice. Check out this link for a more realistic look of the color. I wonder how all of these would look in Houston as opposed to Buffalo? I think I'll try a trial garden of my own next year with these top 4 picks. The garden energy in Buffalo is quite amazing. I have never seen a city so energized by the beauty of flowers. Yesterday we visited the gardens of Summer Street, where several homeowners were either working in their yard (as we gardeners do) and I’m sure preparing for the upcoming GardenWalk or enjoying conversing with us about their garden and their city. Unfortunately, I can’t identify them by name or address, but I can say they were enthusiastic about their city, their garden, and our visit. I talked to one homeowner about his rain barrel. He has a very similar set up as I am planning on testing on my gazebo. He confirmed what I had heard about using a soaker hose…not enough pressure is the problem. So, as a solution he is going to poke a few holes in the soaker hose so it becomes more of a drip system than a soaker system. I have heard this mentioned as a solution before, I hope it works out for him. Another homeowner, Mr. Mimosa we’ll call him, recounted a GardenWalk from the past when the skies suddenly opened up and began soaking the GardenWalk attendees. He invited everyone who was stranded in his yard into his house and what ensued was lively conversation and a mini-party complete with mimosas. How great is that?! From Summer Street we headed to the Japanese Gardens which were a gift from Buffalo’s sister city, Kanazawa, Japan. They have big plans for these gardens; I expect they will be even more majestic in a year’s time. Next on the agenda was Urban Roots. Unfortunately, by this time of day, we were all getting weary of the rain and the rain was starting to come down a little harder than before so I don’t have the whole story of Urban Roots. What I do know is that they are a community based Garden Center, apparently the first garden center co-op in the country. They had some wonderful plants and the Wooly Pocket, which is something I've seen on Jamie Drurie's show, one day I'll try it out. From there, we headed to Bird Ave.Gardens, you can check them out on Facebook. 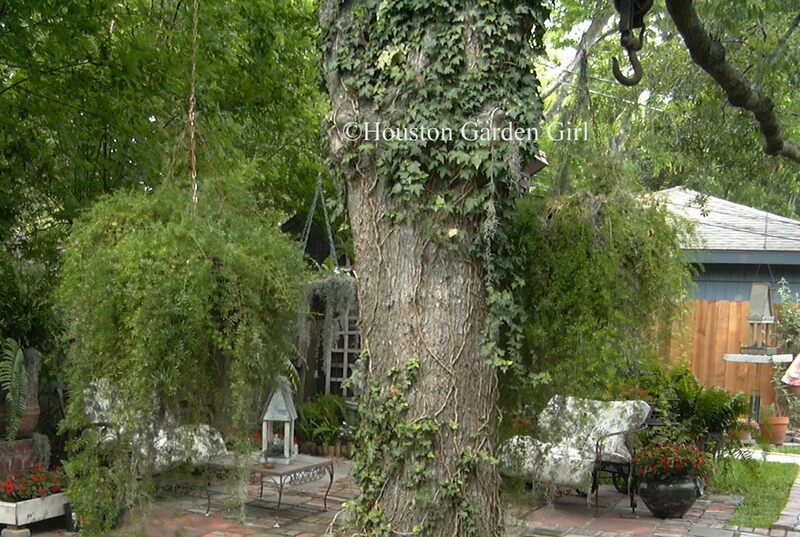 They have a magnificent backyard and hospitality to rival the most gentile southerner. Although, the rain was still coming down, we all enjoyed hanging out in their cool bar area and the makeshift pavilion while enjoying the awesome views around the yard. Thanks again to all those who are making Buffa10 such a wonderful experience. What to do with all the eggplant?